Light weight making installation easier. Hygienic and easy to clean due to the material being both chemical and moisture resistant. Ergonomic design for comfort meaning that this seat has been designed with the user in mind. Made of high stength polypropylene plastic for long lasting durability under regular intended use. Colour matching adjustable bottom fix hinges allowing you to adjust the fit of the seat without removing it. 1 year guarantee for peace of mind. What size toilet seat do I need? There are three places you will need to measure in order to ensure you are buying the right size toilet seat for your toilet pan. Length between fixing holes - you will need to measure the distance between the holes where the fixing bolts will go on your toilet pan. This measurement needs to fall into the "Length between fixings" measurement in this listing. 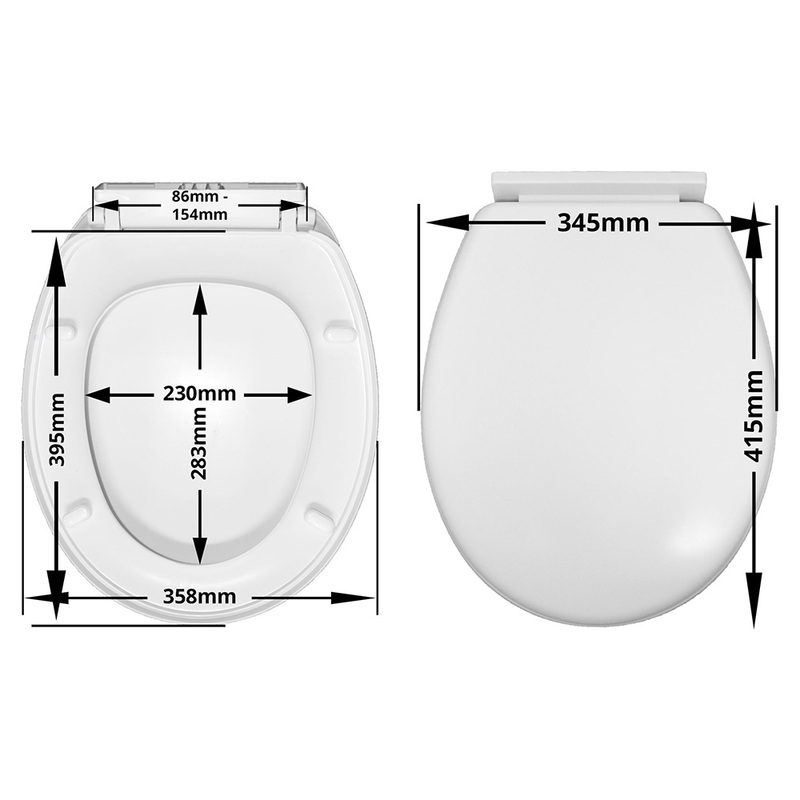 Toilet bowl width - you will need to measure the toilet bowl from one side to the other as its widest point. This measurement needs to match or be very close to the seat width measurement under "Size" in this listing. Toilet bowl depth - you will need to measure the toilet bowl from the very front of the toilet pan to the back where the middle of the fixing holes are. This measurement needs to fall between the seat depth measurement under "Size" and the "Seat Lid Depth" measurement in this listing. There are 3 main toilet seat shapes, this shape should completely match the shape of your toilet pan, otherwise the seat wont fix. Some toilet seats are made specifically for one toilet. D-Shpaed - probably one of the most common shapes. The back of the seat will be straight but the front will come round in a curve like the letter "D". 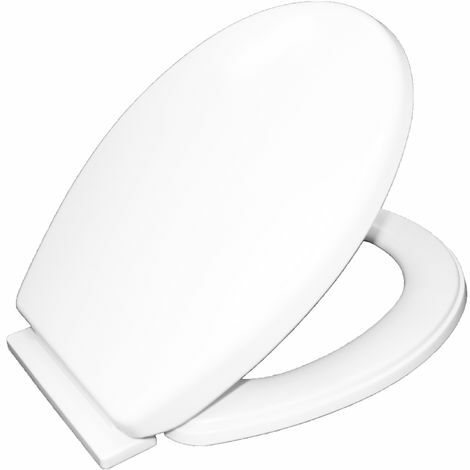 Square - you are most likely to need a square shaped toilet seat if you have a modern toilet pan. The back of the seat will be straight and the front will be squared with a slight curve out. You will need to look at the shape of your toilet very carefully when choosing a square toilet seat. Oval/Round - this shape can be just a common as the D-Shape. The back of the seat will be straight but going forward will get widest in the middle and then round into a curve. Be aware that if your pan resembles a circle then you will need a round seat, not an oval one. Toilet seats will come with either bottom or top fixing kits. However, some can be fitted either way. Bottom fix hinges are a traditional fixing style. To install this type of fixing involves fitting two bolts down into the toilet pan and then tightening them from underneath. if you can see or feel bolts on the back of the outside of your toilet pan then you will need a bottom fix toilet seat. The bottom fix kit comes with: 2 x Screws, 2 x Mounting brackets, 2 x Non slip grommets, 2 x nuts. Top fix hinges are installed by inserting the two bolts into the toilet pan and tightening from the top. If you cannot feel or see the bolts at the back of your toilet (see above) then it is likely you will need a top fix toilet seat. The top fix kit comes with: 2 x Screws, 2 x Mounting brackets, 2 x Non slip grommets, 2 x nuts, 2 x cover plates and some washers. Toilet Seats can come in a few different materials, below are explanations of the materials our toilet seats are made from. Polypropylene plastic - possesses high flexural strength because of its semi-crystalline nature, this combined with good impact strength and fatigue resistance, makes it highly unlikely to break from regular intended use. This type of plastic also has a high level of chemical and moisture resistance, making it perfect for a toilet seat as you cleaning with regular bathroom products or any splash from flushing will not affect the quality of shiny look of the seat. Duraplat (Thermoset) plastic - almost completely scratch resistant and easy to clean using only soap and water. Resembling ceramic, toilet seats made from this material will blend well with the rest of the toilet as well as any other ceramics in your bathroom. They can be a little heavier and more expensive too. Most toilet seats will be soft close but not all will be quick release. Soft close simply means that when lowering the toilet seat it wont slam down. Instead, it should lower slowly and close softly. Quick release seats are designed in a way that allows you to quickly remove the seat from the toilet without removing any screws of nuts, making it easier to clean the pan.